Okay… so there isn’t exactly a formal Bookworm Schedule for September, but there will be next month! We’ll be starting up again in mid-October with a short assembly to introduce the program to new second graders and to see how much third graders have grown–and read– since last year. We’re looking forward to seeing everybody! Karen’s Kolumn is written by Karen Dolley, R.N. and Grange Friend… we appreciate her knowledge and her willingness to share! This month’s topic is especially timely and important… all adults (including school volunteers and Bookworms) have an opportunity and responsibility to be sensitive regarding this issue! September has arrived and Maine children are returning to school. It is an exciting time! Some children will be riding on a school bus for the very first time. There are new teachers and new friends to meet. There are old friends to see again after summer vacation. However, many children are not looking forward to going back to school. 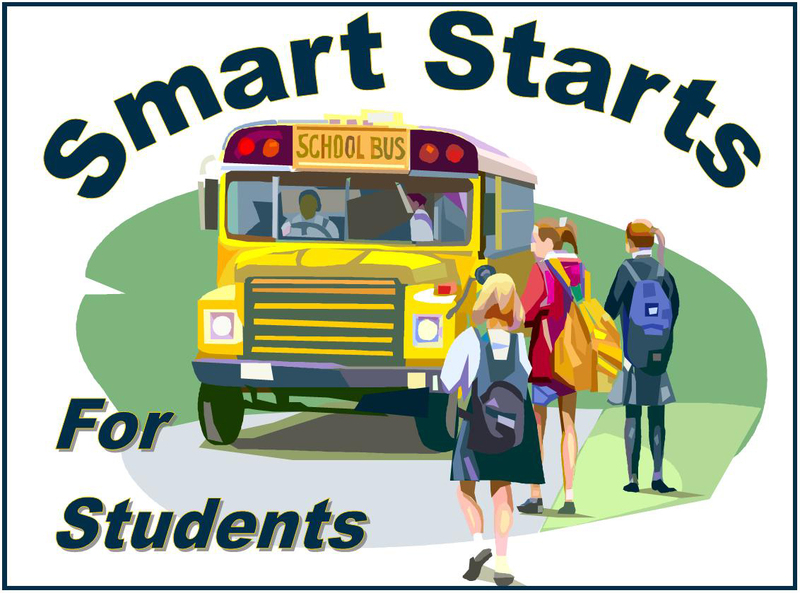 According to the 2009 Maine Integrated Youth Health Survey, over forty-seven percent of middle school children report being bullied on school property and over twenty-three percent of high school students report being bullied on school property. Children are also bullied away from school property and on computers and other electronic devices. Twelve percent of high school students report receiving comments that are offensive regarding race or ethnicity and over nineteen percent report receiving offensive sexual comments related to sexual orientation, masculinity, and femininity. According to the Centers for Disease Control, bullying is a form of youth violence. Bullying includes attack and/or intimidation with the intention to cause fear or to cause harm that is physical, verbal, or psychological. There is a real or perceived imbalance of power between the bully and the victim. The bullying involves repeated attacks or intimidation between the same children over a period of time. The most common form of bullying is verbal bullying. Bullying does affect health. Bullying can result in physical injury, social and emotional distress, and even death. Children who are bullied are at increased risk for mental health problems and substance use. They have higher school absenteeism rates. Children who are bullied do not feel safe in their schools. Victims are more likely to experience headaches, sleep problems and stomach ailments. They also have higher rates of suicidal thoughts. Children who are bullied often do not tell a teacher or another adult because they fear retaliation by the children who are doing the bullying. Children who are bullied are victims of abuse and often do not have the confidence or the skills needed to stop the bullying behaviors on their own. Bullying is not about “kids being kids.” Bullying only occurs when there is a power imbalance where one child has a hard time defending herself/himself and is not simply a disagreement. A child who is bullied should be told that bullying is wrong, no one deserves to be bullied, and everything that can be done will be done to stop the bullying. Research suggests that the best ways to deal with bullying are through school wide programs that discourage bullying, developing consistent rules against bullying, identifying and utilizing a consistent disciplinary program related to bullying behavior, developing and implementing classroom activities related to bullying and bullying prevention, individual and group work with children who are bullied and for children involved in bullying others, staff training to learn to recognize and respond to bullying, improving the supervision of students, and involving parents in bullying prevention and intervention activities. For more information, visit www.maine.gov/education/bullyingprevention , www.cdc.gov/violenceprevention, and http://www.education.com. The goal is to STOP bullying before it starts! The kids start back to school on Wednesday, August 31st… Bookworming and Dictionaries won’t be far behind! If we can have a little fun before buckling down, the following are floating around the Internet under the subject “Why Teachers Drink…” and are alleged to be answers to exam questions by 16 year olds. Q. Explain one of the processes by which water can be made safe to drink. Q. What causes the tides in the oceans? Q. What is artificial insemination? A. When you are sick at the airport. A. Benign is what you will be after you be eight. Janice did her little victory dance… and all around the membership you could hear the smile of victory as the news travelled. (Yes, you can hear a smile!) Valley Grange will be bringing home the Blue First Place Ribbon from the Piscataquis Valley Fair. A major part of our booth was devoted to a "sheep to shawl" demonstration. 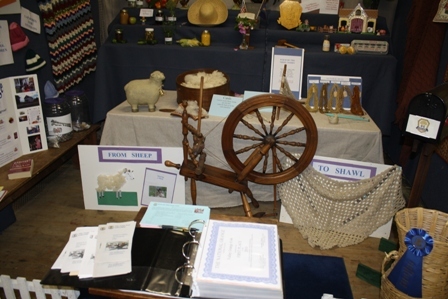 This year’s exhibit featured a “sheep to shawl” demonstration and our 2010 National Community Service Award, along with a mixture of items, products, and information that the judges felt deserved the Award. Setting up the booth was a true team effort under the watchful and artful eye of Mary Annis assisted by Jim and Kevin, Roger and Judy, and Janice and Walter… along with appropriate heckling by several Garland Grange members and a few suggestions from unidentified passers-by. South Sangerville Grange received second place for their display and Garland was a close third. A fourth (Pomona) display focused on the grange in general with specific information about each grange in the area. There’s still time to visit the Grange Exhibit Hall for a first-hand, up close and personal look! Exhibits are traditionally removed Sunday afternoon as the fair closes, but the impending arrival of Hurricane Irene could impact Sunday’s activities. We believe it will be possible to postpone removing exhibits until Monday and that may be both practical and safe! If we receive any official news I’ll either post or pass along by telephone. The obvious hazard with identifying specific individuals and organizations is forgetting somebody! That said, there are lots of people we’d like to thank for their help in making the Italian Dinner a smashing success–including every person who came! A big thank you to the media for the stories and reminders… including WDME for PSA’s the day of the meal… and WABI TV-5 for a mention on the morning news! Thanks also to S.A.D. 4 for their assistance getting the word out… and to the many teachers and staff who came to support us. Thanks also to local businesses for their generousity: Will’s Shop N’ Save, Shiretown Pizza, Save-a-Lot, and Penquis Rental. And to Penquis Volunteers Kara & Tessa Jackson, Debbie Somers, Darlene Clukey, Jessica Davis, Ginger Hutchins, James, Madolyn, Crystal & Virginia Macomber, Joshua Brown. And for food donations from Cheri Snow, Shannon Bonsey, Cindy Pullyard, Debbie Somers, Sheree Brown, James Macomber, Denise Trafton, April Sargent, Neil Greenberg, Kara Jackson. A special thanks to Valley Grange member Janice Boomsma for her cleaning efforts–she did some nasty jobs… and for shaking the money out of attendees pockets with Tessa’s assistance! One person who deserves a big thank you and round of applause is Sheree Brown from Penquis. When we decided to do this, we agreed this had to be fun and it was, from beginning to end! Her energy and enthusiasm is both boundless and contagious–she’s organized and gets results. Thanks, Sheree for what you do and who you are! “It’s been a long time since I came to a Grange event here and had to park way over in the hay field,” commented Terry Spencer from Skowhegan. He and his wife Harriet had come as part of the state team leading the Officer Installation Program at Valley Grange in Guilford last Friday, and they found themselves surrounded by scores of friends and neighbors, Italian Music and the smells of lasagna and spaghetti. The Grange decided to try something different this year, according to Walter Boomsma, Program Director for Valley Grange. 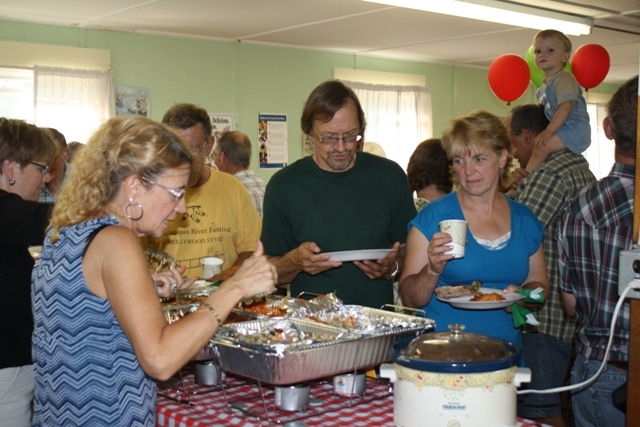 The Grange teamed up with Penquis to sponsor a public supper before the annual grange program. Sheree Brown of Penquis immediately recognized an opportunity to hold a “last minute” fundraiser for the Smart Starts for Students Project—a school supply assistance program for the greater Piscataquis area by providing starter packs of new school supplies for families in need throughout MSAD #4, #41, #46, #68 and Union #60. 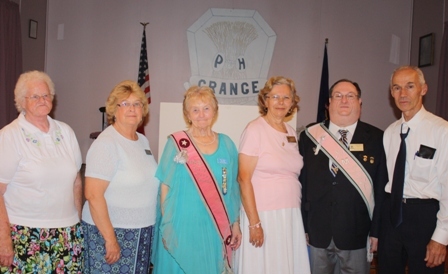 Installation Team Linda LaBree, Glenda Barker, Mary Thomas, Harriet Spencer, James Owens, and Terry Spencer. “He was correct on so many levels,” Boomsma noted. “So many people came out winners… from the organizations involved to the people who ate… to the kids who will get their school supplies.” Penquis and Valley Grange were joined in the effort by a number of local individuals and businesses who contributed food and supplies. While the final counts weren’t immediately available, the two groups served at least 120 people and raised over $850 for the project. Valley Grange is honored to be hosting the annual installation of officers ceremony on Friday, August 19th at 7 PM and the public is invited. For those unfamiliar with Grange structure, the organization follows a “grassroots” model starting with local or community granges also called subordinate granges. These subordinate granges are clustered into Pomonas–historically the Pomona Grange followed county lines, but over the years these lines have blurred with Pomonas now organized in more regional fashions. The local Piscataquis Pomona includes Valley (Guilford), Garland, Dexter, South Sangerville, East Sangerville, and Parkman Grange. The installation ceremony being conducted on Friday is organized by the Pomona with all subordinate granges invited to participate. State Grange Leader James Owens will lead the ceremony assisted by a special installation team. In years past Pomona Meetings were big events–sometimes lasting an entire weekend with members “camping out” at a local Grange Hall. These campouts always featured great food–a grange tradition. While this year’s event doesn’t include camping, it does include a food opportunity. In planning this year’s grand event, Valley Grange is collaborating with Penquis to provide an Italian Dinner that will benefit the Smart Starts for Student’s Project. For a minimum donation of $6 for adults, $3 for children 5 -12 (under 5 eat free) folks will enjoy a wide variety of Italian Dishes and a build your own salad bar. The public is invited to either the dinner, the installation or both! This is an unusual opportunity for a great meal and to learn a little bit about the granges who are serving communities in the area. Dinner will be served from 5 PM until 7 PM (or until the food runs out)… Installation will begin at 7 PM. Come join your friends and neighbors! Regular visitors will find a few small changes to the site… being a bit “laid up” for a week or so gave me some extra computer time! There have been some “behind the scenes” changes that won’t be apparent and most people would find fairly boring. Suffice it to say that WordPress (the software that makes this possible) has been making some great enhancements — some make the job easier, some make the site better. Considering how much this all costs (nothing!) it’s a pretty amazing package. One noticeable change should be “sharing buttons” at the bottom of posts and pages. These buttons will (hopefully!) allow you to share a post or page with others… for example, if you click the “Facebook” button, you’ll be calling attention to that post on Facebook. (I am not a huge Facebook user, but recognize that a lot of people do spend time there.) Some of the less popular social networking programs can be found under the “more” button. Feel free to comment regarding this… or any other feedback you’d like to offer regarding the site and what’s posted here! Today we make fun of “solar clothes dryers,” but it wasn’t so long ago that everybody knew these rules! You had to wash the clothes line before hanging any clothes – walk the entire lengths of each line with a damp cloth around the lines. Wash day on a Monday! Never hang clothes on the weekend, or Sunday, for Heaven’s sake! Hang the sheets and towels on the outside lines so you could hide your “unmentionables” in the middle. Clothes off of the line before dinner time, neatly folded in the clothes basket, and ready to be ironed. IRONED?! Well, that’s a whole other subject! The Town of Dexter is applying for a USDA Value Added Producer Grant that will help with the Dexter Community Farm Project—a project that includes the renovation of the Fossa General Store. The project has made tremendous progress—notable just by driving down Main Street and checking out the store! You can also get more information by visiting the project website or the Dexter Community Farm Blog. This grant will provide a huge lift with the working capital necessary to get the store open and running… a business plan is being tweaked and will be submitted with the grant application. Another necessary addition to the application is a sheaf of letters of support from local farmers, businesses, organizations and individuals. If you are impressed with the work these folks have done and the idea of this project, send your letter of support to David Pearson, Town of Dexter, 23 Main Street, Dexter ME 04930. If you’d like help forming the letter, contact judy@DexterFarmProject.com. You can also email your letters to her and save a stamp!